Collier Research Corp.’s, James Ainsworth, who will present at CAMX, inspects a curved orthogrid shield drop-test specimen. Hampton, Virginia – At the Composites and Advanced Materials Expo (CAMX) (previously SAMPE), Oct. 13-16, 2014, at the Orange County Convention Center in Orlando, Florida, Collier Research Corp. will demonstrate a key software program, HyperSizer, used to lightweight the heat shield of NASA’s Orion multi-purpose crew vehicle. NASA’s Orion team utilized information gathered from HyperSizer analyses to inform discussions that led to a 23% reduction of the final weight of the baseline design, which means hundreds of pounds of unnecessary weight were eliminated. The un-crewed test flight of the vehicle, Exploration Flight Test-1, is currently slated for December 2014. The final HyperSizer-designed heat shield will be used on later, manned flights. For those interested in learning more about this project at CAMX, James Ainsworth, aerospace stress engineer at Collier Research, will present a paper during the Thursday morning session that will give an in-depth look at the design and analysis process, as well as the analytical methods used to perform trade studies of the Orion heat shield carrier structure. 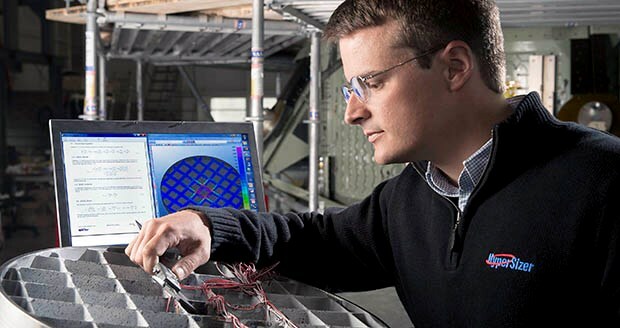 HyperSizer, the first software commercialized out of NASA, provides stress analysis and sizing optimization for reducing the weight of aircraft, wind turbine blades, and other structures in addition to space vehicles – whether designed with composite or metallic materials. A typical HyperSizer analysis produces weight savings of between 25% and 40%.